Is large caliber a must for Sasha? I've always been under the impression large caliber was a must for Sasha to increase the number of enemies hit to therefore increase the chances of getting charge points... but then I found this. Should I upgrade or look for something better? 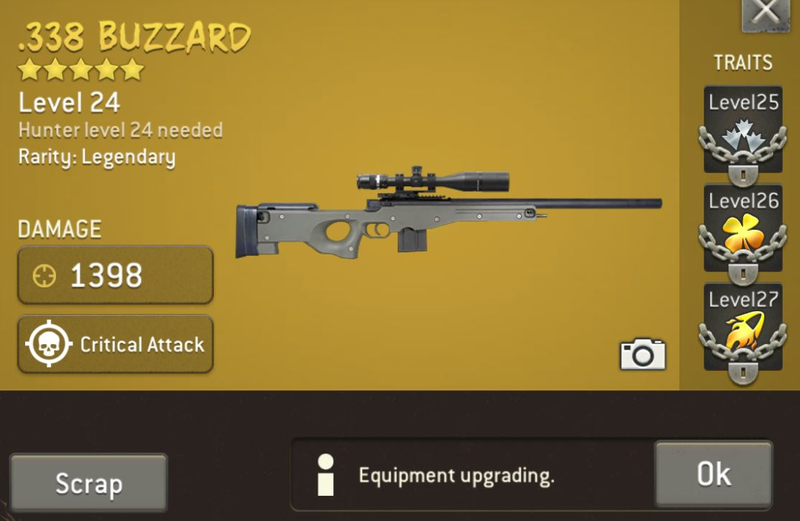 Of course you should upgrade that rifle, and no, large caliber is not essential if you have those combination of traits.Thats very good trait, but I know many peeps who's playing without it.Your rifle is example why. It is perfect for the distance and high level challenge missions imo. My Non- Sasha leader unicorn rifle is large caliber, incendiary and piercing!!! No it's not a must. Depends a lot on your playstyle also game mode and map. It is particularly useful when there's a lot of walkers. I'm a big fan of the wide bore for Sasha, but I'm a bigger fan of the Gold Critical Damage for my rifles for use in The Distance. It's nice to dish out that 60% extra critical damage. Of course, I like to light the walkers on fire when I can in The Distance. I consider this rifle my near-perfect unicorn rifle... Except I would swap out the Wide Bore to Silver and the Incendiary to Gold, but you can't have it all. I consider this rifle my near-perfect unicorn rifle... Except I would swap out the Wide Bore to Silver and the Incendiary to Gold, but you can't have it all. I tried man. I really really tried. I'm with you on the destructive trait, I'm starting to like that more and more, but I think I gotta have gold luck for Sasha to help boost her hero trait, even a little. Getting those charge points is the most important thing! @Deadheads. Yeah, I hear that. I plan to upgrade this rifle next... When I use this, I'll probably have a shooter with the Flare Gun or an assault with the Dixieland BBQ to go with it. It will depend on the map. Aye, incendiary can be lethal to you if there isn't enough room to keep out of range of a burning fattie. So this would be a good Distance speciality rifle??? The more I use wide bore, the more I love it. I will be sad to leave these two behind as I upgrade my survivors. @CBgaming1969 That is the same one as @Governator posted, and IMO, that is an awesome combo of traits that is not only good for distance missions, but also for high level challenge. If I had one of those I would have it equipped and used by Sasha at all times. I have large caliber, incendiary and luck for Sasha when in leader and other large caliber and incendiary rifles for outpost defense and when I use more than 1 hunter. I guess I'm asking for the 18 and up hard distance...should I take incendiary rifle, bbq and that one once upgraded to take down the real tough ones? I have had success on the Fish in a Barrel map with Sasha as lead hero armed with RPG. Even though it doesn't include body shot in center I still get the charge point for the body shots outside target and follow that up with the High Tech AR (charging trait & 60% extra stun) with an interrupt on the third player. Basically tho, my point is that the RPG is worth considering with Sasha. The RPG doesn't give you body shots inside the target but the few shots on the outside are body shots every time so it's actually kinda the opposite of canceling out. You get the direct hit and still gain charge points off the 3 body shots. I been using her as hero with the charging high tech AR and a shooter with piercing, charging and interrupt. Worked like a charm untill lv 29. I wouldn't lie. My RPG is rare if that counts for anything. 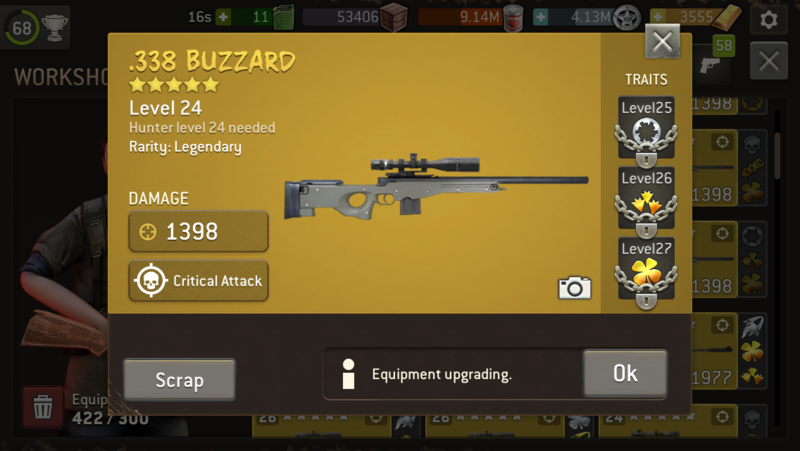 I won't upgrade hunter weapons without at least silver bore. But, this is because I'm not at end game just yet. This means I have to be choosy about where I spend XP - training and upgrading. I'm jealous of end gamers who have more diverse set of weapons and armour, but am not rushing because I still want strength in depth as I grow. I would say a growing player needs at least one effective wide bore weapon, but at the end gamer stage, there is more opportunity to experiment and build up a bigger arsenal. 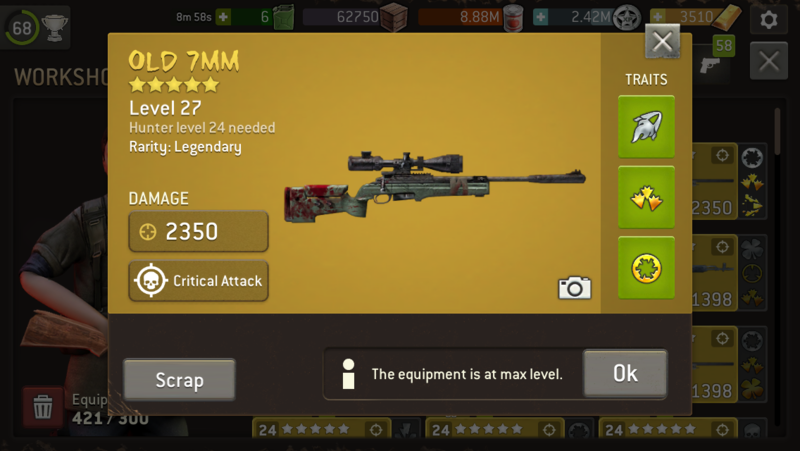 And now I scrolled back to top to see weapon level, my view here seems irrelevant as it's a lvl 24. But leaving this as is as might be useful for non-endgamer perspective. NO!!! LUCK is a MUST!!!!! But, depending on your playing style large caliber is second or third. I am toooooo used to playing with widespread, large calibur and extra spaces to ever go back. My only consideration now is should it be silver or gold !!! I'm waiting for Excalibur for warriors - don't care about the color but it needs to come with all the knights of the round table. That would be the holy grail.